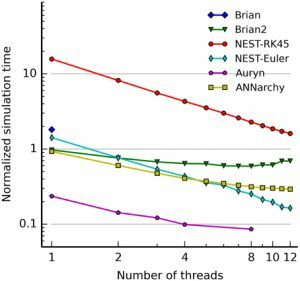 Auryn is free modular software to efficiently simulate spiking neural networks with synaptic plasticity. I developed Auryn initially during my PhD and used it for several studies (Vogels et al., Science, 2011; Zenke et al., PLOS Comp Biol, 2013; Zenke et al., Nature Comm, 2015; and more). Auryn’s code is released under the GPL and free for you to use. 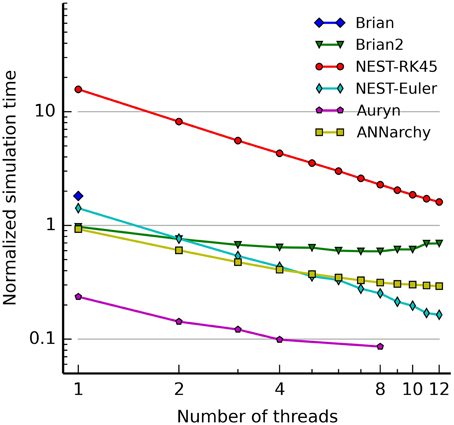 Performance: Auryn offers great speed-up which allows to efficiently run simulations of spiking neural networks to study synaptic plasticity (e.g. STDP or voltage-based plasticity rules). For medium sized spiking neural networks it has been shown to outperform a range of other simulators (see Figure) and its performance has been constantly increasing since.